Leave a commentIf Lebanon is on your travel radar as a place to visit, you may not think of bringing your walking boots. Yet my video about the day I spent hiking in the Tannourine Cedar Forest Reserve will show you that this is one of the highlights of a visit to Lebanon, especially in the spring and early summer when the wild flowers are in full bloom. With my friend, I joined a group trip organised by Cyclamen, a local tour company, and drove north out of Beirut into the beautiful mountainous region inland, stopping only for a Mankouche for breakfast. If I ever get back, it will be to walk for a few days along the Lebanon Mountain trail, which the Tannourine Reserve is part of, staying in local villages that now offer Bed and Breakfast. The Cedars of Lebanon are such an important symbol that they appear on the Lebanese national flag, yet the impression I got from my visit to see them was that there were barely any left. The reason is that the cedar is a valuable wood, prized for it’s hardness, it’s fragrance and it’s properties as a natural insect repellant. 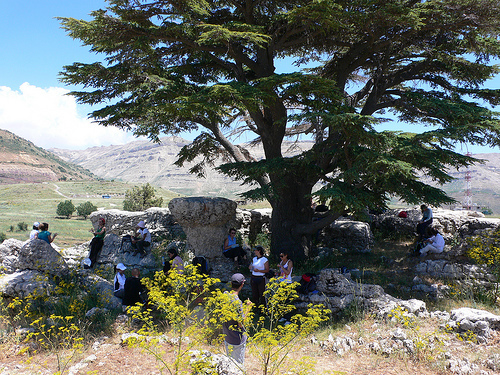 Now the cedars that remain in Lebanon are protected in National Forest Reserves and a programme of replanting is underway, although as these trees take many decades to reach any size, it will be centuries before the famous forests that once covered the mountains of Lebanon recover.